The Modern/Contemporary Art Section of the Department of Art Research, Archives, and Information Systems is proceeding with a research project on “Research on the history of cultural exchanges in modern and contemporary art.” This project covers modern and contemporary art in Japan and other countries in East Asia. As part of this project, ZHAN Xiaomei, Associate professor at Tokyo Institute of Technology delivered a presentation entitled “Letters from LIAN Quan to OMURA Seigai” at a seminar of the Department of Art Research, Archives, and Information Systems on April 25. 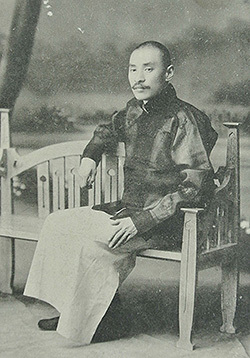 LIAN Quan (1863‐1932) was a modern Chinese man of letters who was active as a collector of calligraphic works and paintings and as a poet. LIAN made several trips to Japan, where he exhibited his collection and published catalogs. LIAN wrote to OMURA Seigai (1868‐1927), who was known to be an authority on Oriental art history, and 34 of those letters were among the materials related to OMURA that were recently donated to the Educational Materials Office of the Faculty of Fine Arts, Tokyo University of the Arts. ZHAN’s presentation was based on a study of those letters. LIAN Quan had 1,000 or so fans with paintings by Ming and early Qing painters such as TANG Yin, WEN Zhengming, and WANG Jianzhang. The letters to OMURA mostly concern the sale of LIAN’s fan collection, and the text indicates the extent of the trust LIAN had in OMURA. The letters also reveal that OMURA was indebted to LIAN Quan since LIAN introduced OMURA to notables in the world of calligraphic works and paintings such as WU Changshuo and WANG Yiting when OMURA traveled in China from year 10 of the Taisho era (1921) to the following year. The letters are valuable documents that vividly depict the exchange between Japanese and Chinese at the time. TAKIMOTO Hiroyuki, a writer and researcher of Chinese painting and YOSHIDA Chizuko of the Educational Materials Office of the Faculty of Fine Arts, Tokyo University of the Arts attended the seminar and furthered discussion. Plans are to reprint the letters by LIAN Quan in the research journal Bijutsu Kenkyu (The Journal of Art Studies), which is edited by the Department of Art Research, Archives, and Information Systems, and have ZHAN Xiaomei describe them. 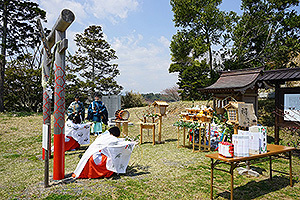 As part of a survey of intangible cultural heritage in areas stricken by the Great East Japan Earthquake, an annual celebration at Yamada Shrine in the City of Minamisoma, Fukushima Prefecture was attended on April 23, 2014. Located on the coast, the shrine was washed away by the tsunami following the earthquake, and the area served by the shrine suffered heavy losses. Chief priest MORI Yukihiko also works as a curator at Fukushima Museum. In addition, comments and expressions of sympathy were received by the Intangible Cultural Heritage Information Network operated by the Department of Intangible Cultural Heritage. After the disaster, a temporary shrine was built through the efforts of volunteers from Kumamoto Prefecture. One the date in question, a number of attendees joined parishioners as a result of extensive media coverage of the plight of Yamada Shrine. However, parishioners’ organizations in many of the surrounding areas are on the brink of collapse. Major issues regarding maintenance and reconstruction of the shrine remain. Religious institutions like shrines and temples tend to be thought of as distinct from management of cultural properties in light of the separation of church and state. That said, the existence of those institutions is closely tied to the passing down of intangible cultural heritage. Thus, relevant information needs to be shared and issues need to be discussed in the future. Research results and projects have been periodically publicized in the Institute’s entrance lobby on the 1st floor. This time, the exhibition shows materials and techniques that are indispensable to create, appreciate, restore and conserve paintings and calligraphic works. The exhibition was planned by the Japan Center for International Cooperation in Conservation, and all of the images were taken by SHIRONO Seiji of the Image Laboratory of the Department of Art Research, Archives, and Information Systems. 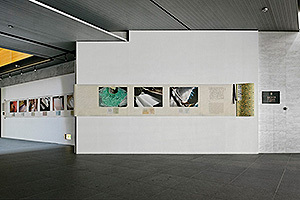 The exhibition panel has been fashioned into a long hand scroll so that the visitors may realize that cultural properties are made with various materials and techniques The scroll is 1.15 m tall and 14 m long and it has a cover as well as a roller rod according to the Japanese traditional mounting method. 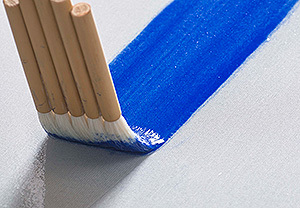 Large photos depict moments that highlight the qualities of materials and techniques—such as the overlapping of paper fibers to produce a single sheet of paper, the crushing of rock and its refinement into powder for use as a bright pigment, and the methodical preparing and spreading of paste. In addition, actual samples of Washi, silk for painting, pigments, karakami and tools of conservation works are displayed in the showcases. Techniques to produce materials and conservation tools as well as techniques to restore cultural properties described in the exhibition must be preserved. In Japan, these techniques are designated as Important Intangible Cultural Properties or Selected Conservation Techniques by the Japanese Government. On the other hand, techniques and materials that have been cultivated in Japan are widely known for their usefulness and are applied for the restoration of cultural properties in foreign countries. 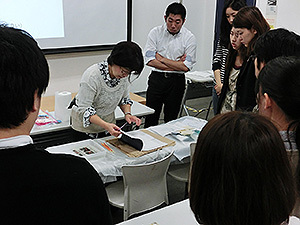 The Institute also conducts international training projects in order to encourage a correct understanding of Japanese restoration techniques and materials. We hope visitors may learn that the world’s cultural properties are being protected by Japan’s exceptional traditional techniques to hand them down to future generations.